Self-Care benefits everyone in the community. The following table illustrates the theoretical opportunities and challenges to the greater deployment of self-care from the perspective of different stakeholders. The challenges notwithstanding, self-care has been called the next ‘megatrend’ and presents many opportunities for all the many stakeholders in health – individuals and their families, communities, governments, healthcare professionals, industry and others. Research shows that patients and consumers who take a more active role in their health decisions will live healthier lives and be more satisfied with their health care and treatments results. In a self-care setting, the community pharmacist is no longer a mere supplier of medicines, but a team member involved in the provision of a growing range of healthcare products and services. This includes disease prevention, minor diagnostics, and the nonprescription products. In a survey undertaken in 1999 in the UK, 93.4% of GPs agreed that the key to reducing the number of consultations for minor illnesses is “to increase the patient’s confidence in their own ability to handle minor illness health problems”. This would allow them to dedicate more time to patients with more serious conditions. 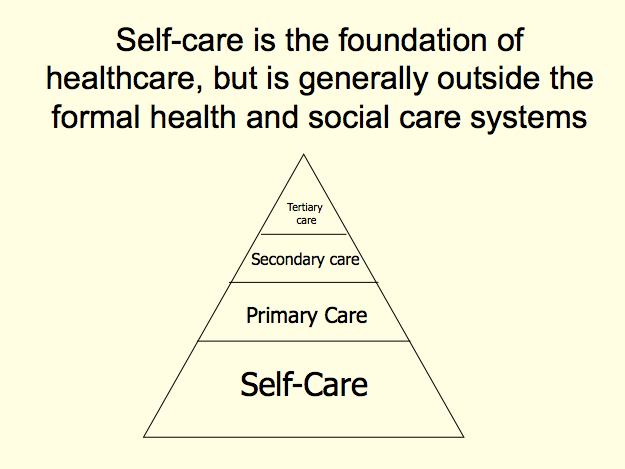 A healthcare system which emphasizes self-care offers more ‘patient-centered’ and “disease-preventive” healthcare services, leading to improved public health standards. The accent is placed on collaborating with patients and families and providing them with the information and tools to practice self-care. Policy recommendations also need to be developed for the roles and activities healthcare professionals and others need to adopt to encourage self-care. The ISF is working with others to help understand self-care friendly policies and best practices. If the average person sees a doctor 3 times a year for 10 minutes each time (total 1/2 hour), the rest of the time (365 days x 24 hours = 8759.5 hours) is in reality self-care.